Soviet Square, Ulan-Ude, decked out for 2015. The central “avenue” you see is the terminus of an ice slide 75 yards behind me. Happy 2015! 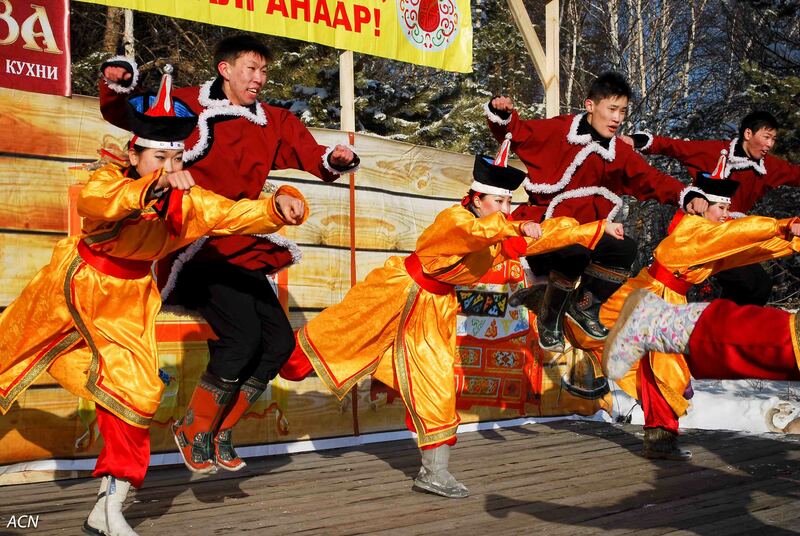 We are getting close to the New Year here in Ulan-Ude, it is just over two hours away. 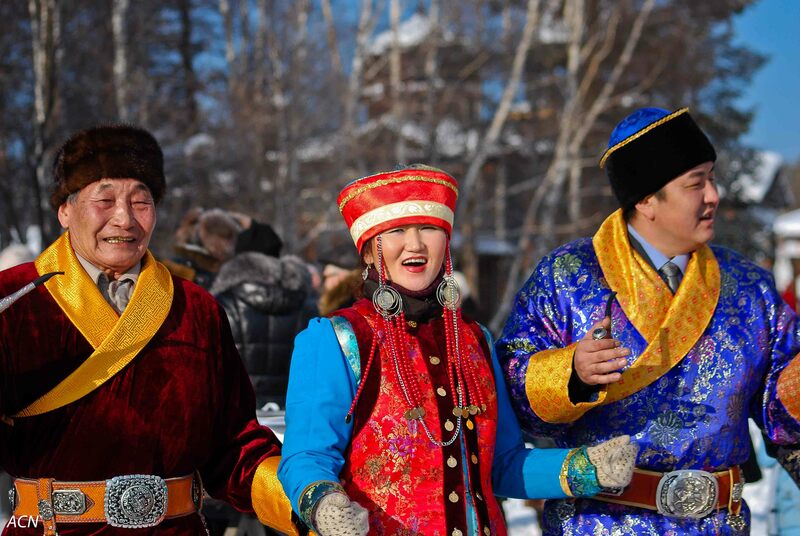 I went out in -15 F to capture some of the festive Siberian spirit. I have photographed in colder, but I admit my fingers turned to bricks, and I had resort to sticking those ice bricks in my pants, I mean IN MY PANTS. 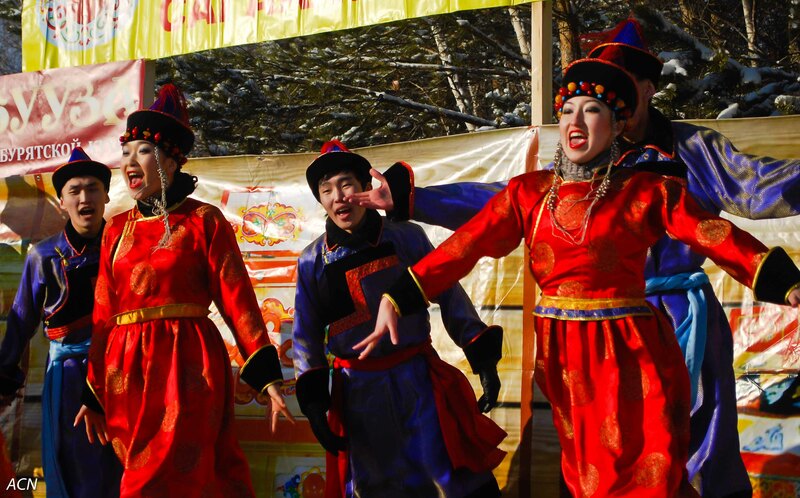 You dance a bit, but you can warm up frozen photographer’s appendages fast! Our Siberians are bundled in all types of fur, from reindeer hide boots, to sable coats and fox, rabbit or hats of mink. Ice is king during the New Year, and right this moment kiddies and their Moms and Pops alike are sliding down ice slides with shrieks of glee. The first round of celebratory fireworks have met their match so to speak, but there are numerous rounds to come. 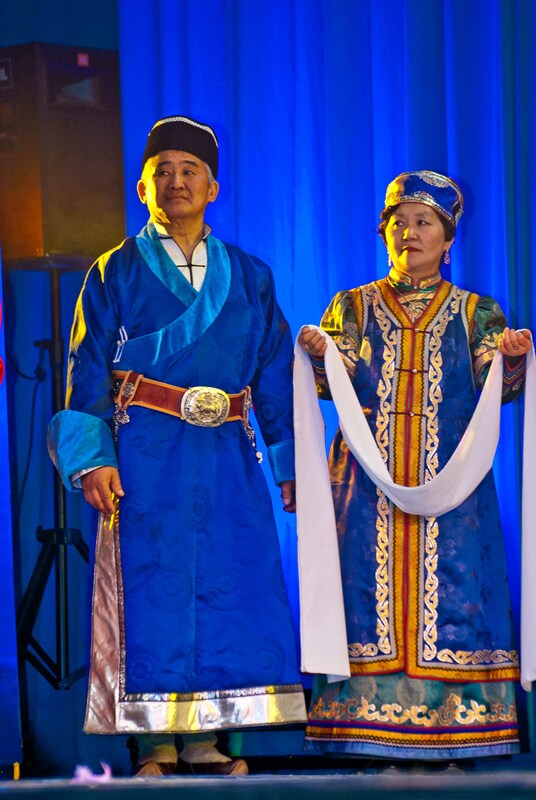 A Very Happy New Year to you, from us on the steppe! Next up, Christmas! 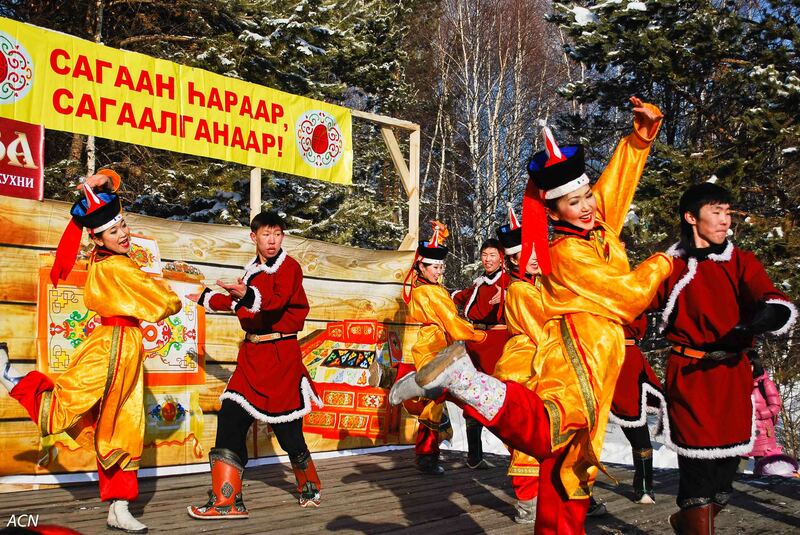 Russia celebrates Christmas day on the seventh of January. Fireworks bust over Lenin’s head to cheer the hearts of the people. 2015 is the year of the goat. And that is who you see lit and enthroned in ice with the Opera theater in the background. Passing the glass for a celebratory drink. 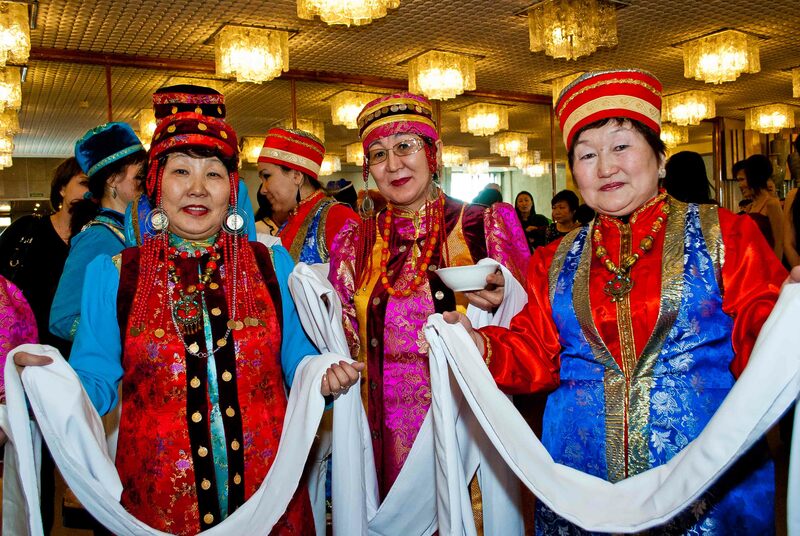 White Month (Sagaalgan), the most important holiday of the Buryat people is upon us! 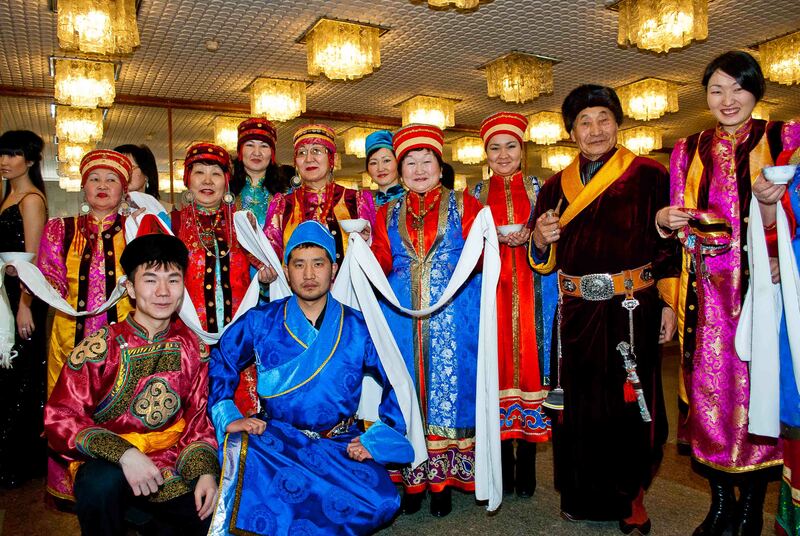 Together with the rest of the Asian world, the Buryats’ celebrate the lunar New Year, which kicks off White Month. 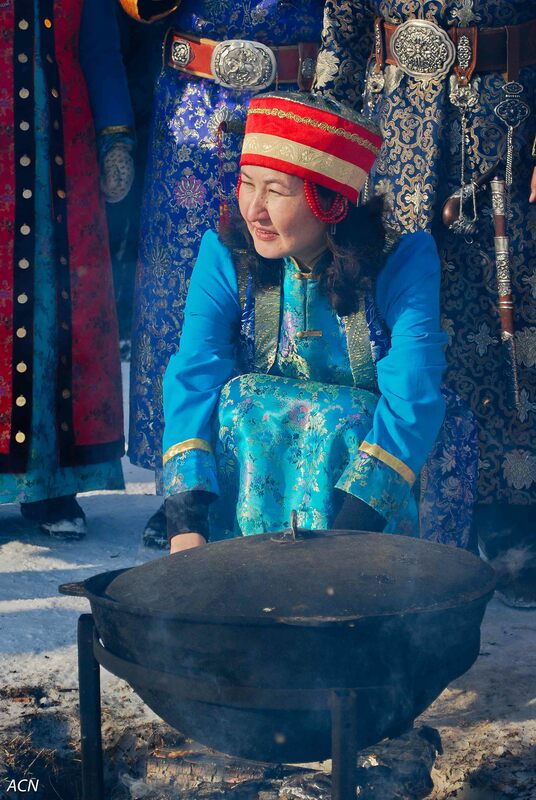 White Month is celebrated by visiting family and friends, having guests over and eating white foods. White foods are milk based and include salamat, fried sour cream mixed with flour, cottage cheese, and aarsa which is a milk drink made from a fermented milk base cooked together with fresh milk. The results are a somewhat sour yet tasty beverage. Why the emphasis on white you ask? Learn more about that in a later post. 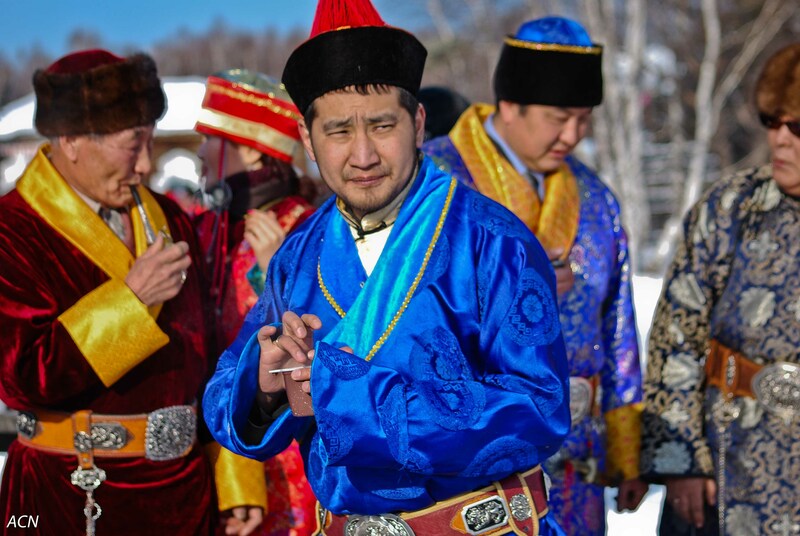 Until then, enjoy these photos from a celebration of Sagaalgan near Irkutsk put on by the Center for the Protection and Development of the Buryat Ethnos. 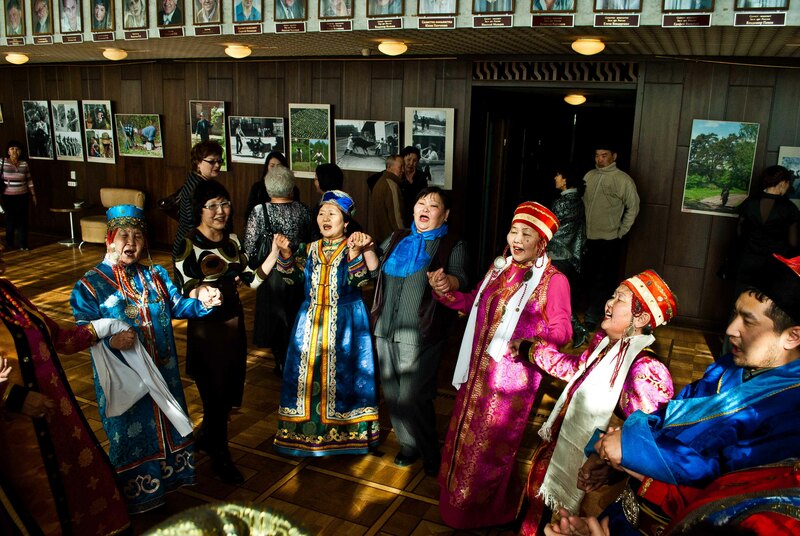 Gettin' their Buryat dance on! 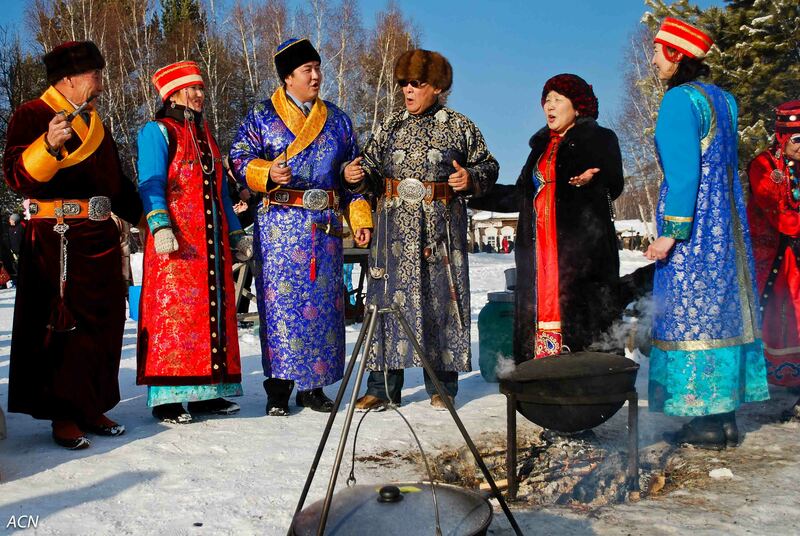 Western Buryats serenade the gathered witnesses. This young man is dipping his finger in his tea to drip some upon the ground as a sacrifice. 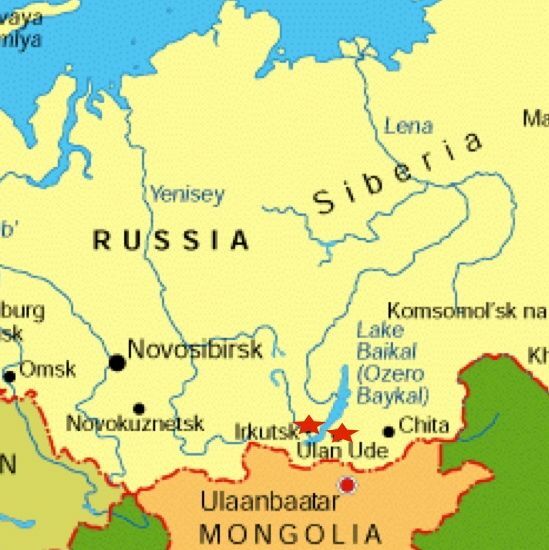 If you think Siberia is only cold, grey and icy, think again! The color and movement is enchanting. 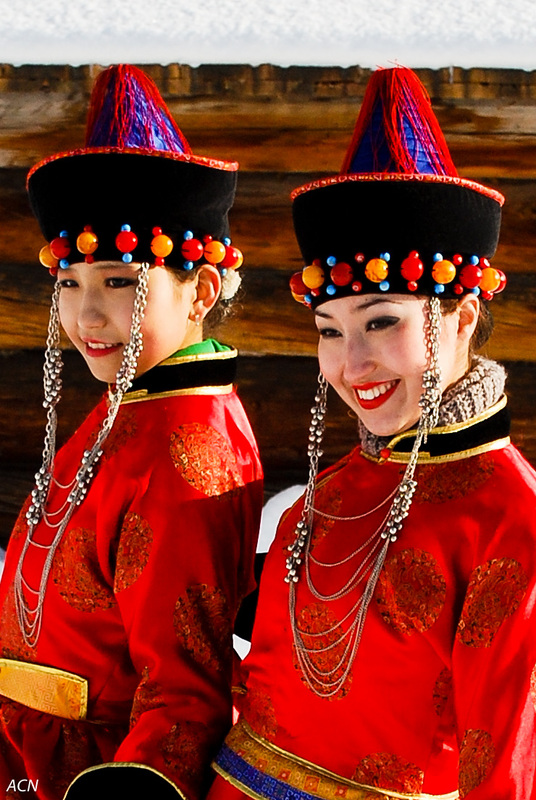 Buryat maidens strike a pose for the local news crews. The crew of "Crystal Swan" ice cutters, stars of History Channel's new hit "Ice Slicers". Wednesdays, 10 central, 9 mountain. Earning their pay. Note the boats frozen into the harbor. When I saw the standing columns of ice on the Angara, I was drawn to them like a magnet. 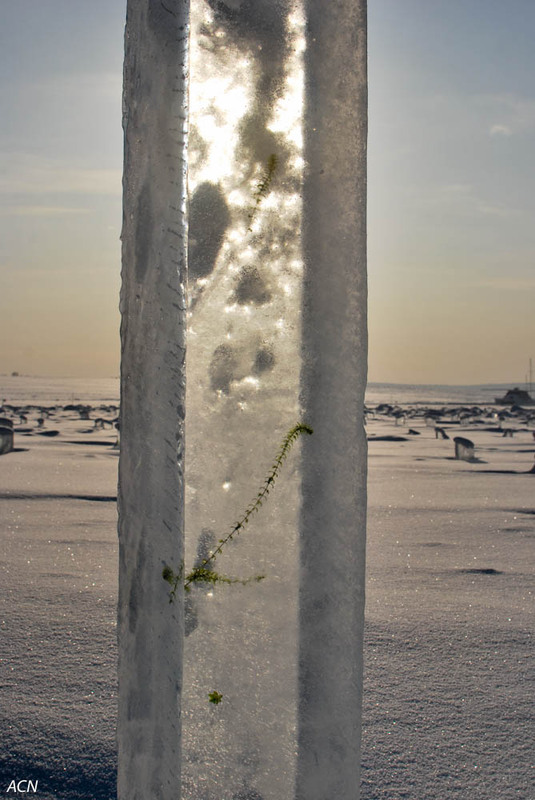 Like some crystal Stonehenge, ice columns and ice blocks gleamed in the winter sun. 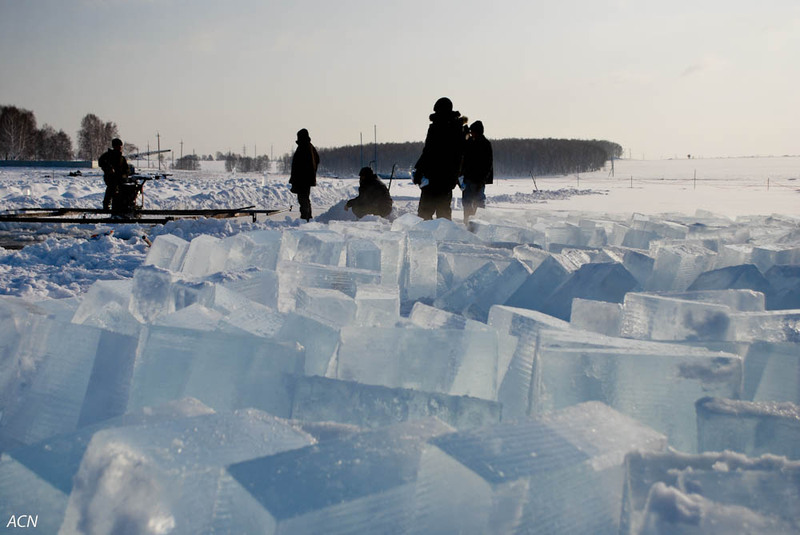 I stopped on the river bank to take in the whole sight: Fishing trawlers and sailboats frozen into their winter rest, hundreds of blocks of blue-glow stacked ice, a silhouette team of ice cutters toiling against the frozen surface of the river. 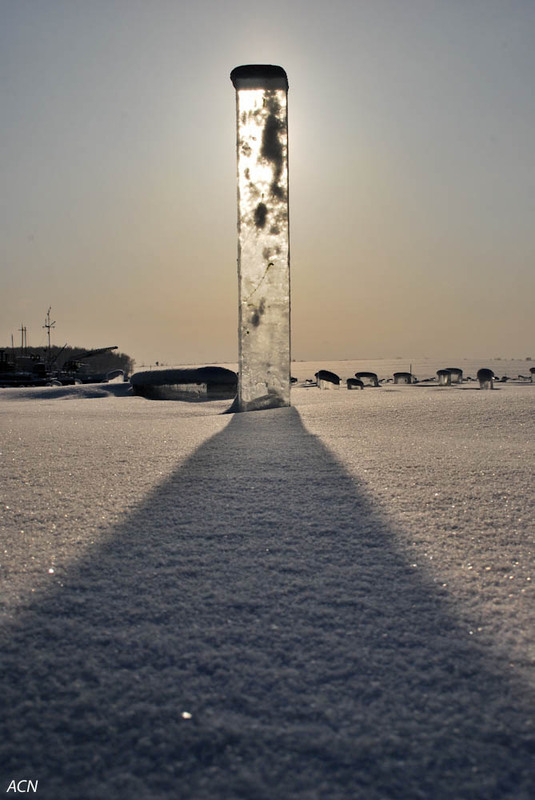 An ice "stele", transient monument to an enduring Siberian winter. The photographic possibilities seemed endless, and I set about capturing this strange benumbed world. 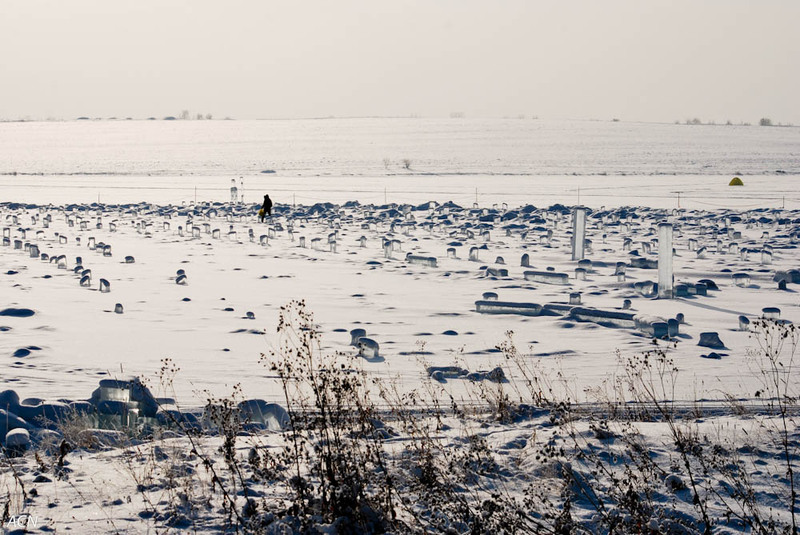 Stretching out on a bed of bright snow for half a mile was what looked like an ice graveyard, frozen snow capped monuments a silent memorial to some cold-blooded race. The "graveyard' effect is actually for safety. The cutters mark holes with ice blocks to warn anyone venturing onto the ice. Ice sawyer Sergei wielding his blade. A small shack, shelter for ice cutters, stands on the shore. Andrei, one of the crew appears and I introduce myself. Andrei gladly answers my questions, taking me over to the working crew. Vapor lifts off the surface of several 10 by 10 foot windows into the deep. The sound of shovels scrapping snow from ice accompanies the gas engine’s low growl as it powers the two foot chainsaw blade. The engine and blade are fastened to a rail which moves in roughly 8 inch increments along a steel frame anchored in the ice. Sergei the “blade runner” lifts the rail one notch over, saws a ten foot slit into the ice, lifts and slides the rail over 8 inches and saws again. When he reaches the frame’s edge, they lift and rotate the rail ninety degrees and our ice sawyer duplicates the process. The results are uniform 8 inch by 1.5 by 1.5 foot ice blocks. Sayan the hauler, then fishes out 120 kilo’s of ice with huge ice tongs. One block weighs 40 kilo’s or about 88 lbs. (They measure in metric here.) The process was a bit mesmerizing, and I watched for some time. Sayan hauls the frozen payload. 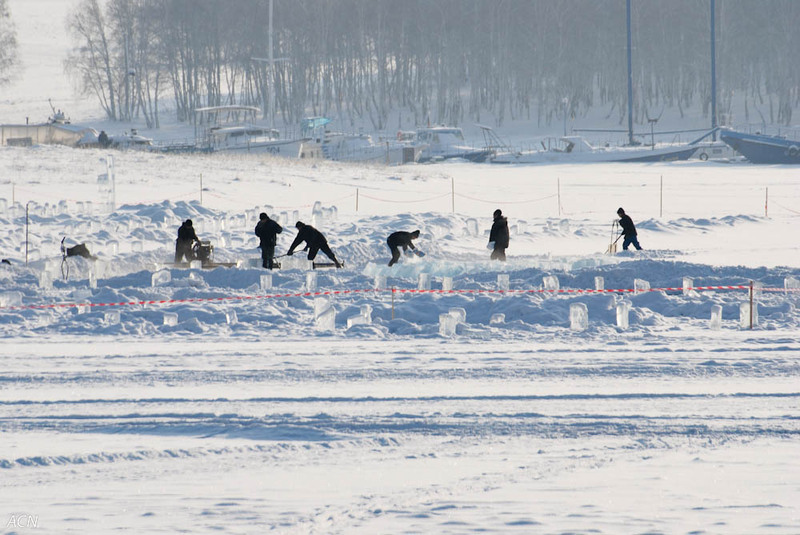 The boys of Crystal Swan Ice Harvesters had been cutting ice for over a month now, the boss, Slava Maksimov told me. Nothing stops these boys, not even last weeks – 40’s temperatures. With the stove stoked, the whole pack packs into their shack for the night, (with plastic sheeting for windows) and in the morning load ice despite the weather. 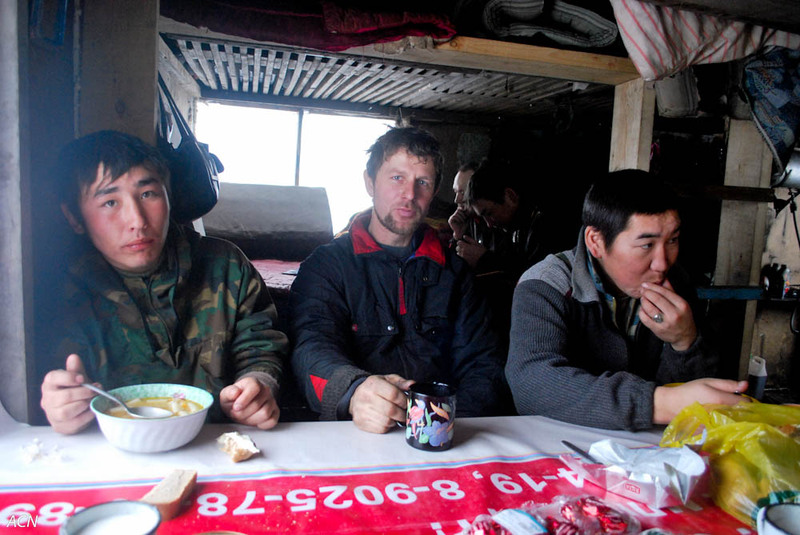 Slava has been harvesting ice for about thirteen years. 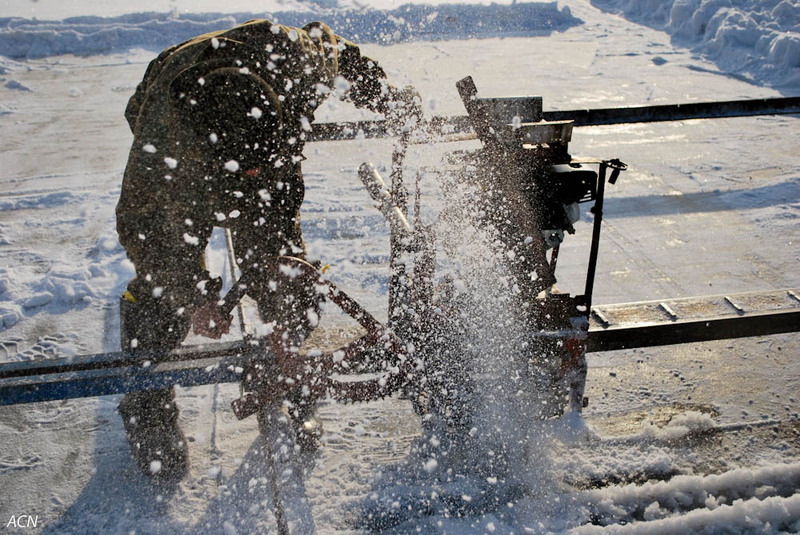 In 1997 when he started his business, all ice was harvested with hand saws. Ten years ago Slava realized using a frame to cut from would be more efficient, faster and easier. 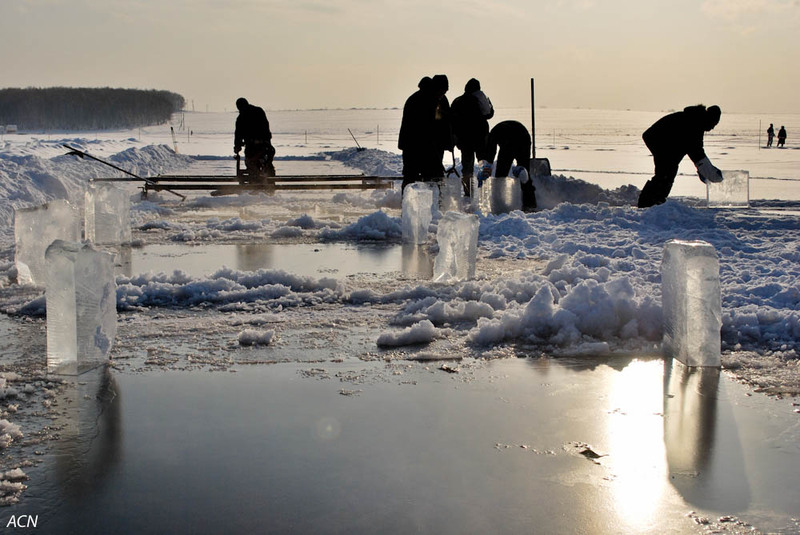 Each December Crystal Swan harvests between 30,000 and 40,000 blocks of ice. Dinner in the cutters shack. 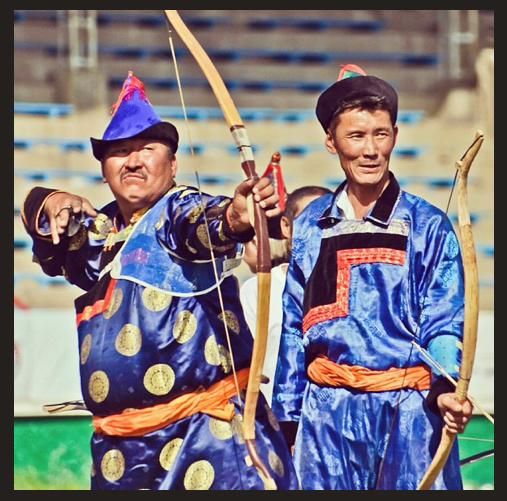 Sergei, Slava the boss, and Sayan. Stacked and carved, the ice is transformed into luminous fairytale kingdoms on central squares of Siberian cities to celebrate the New Year. 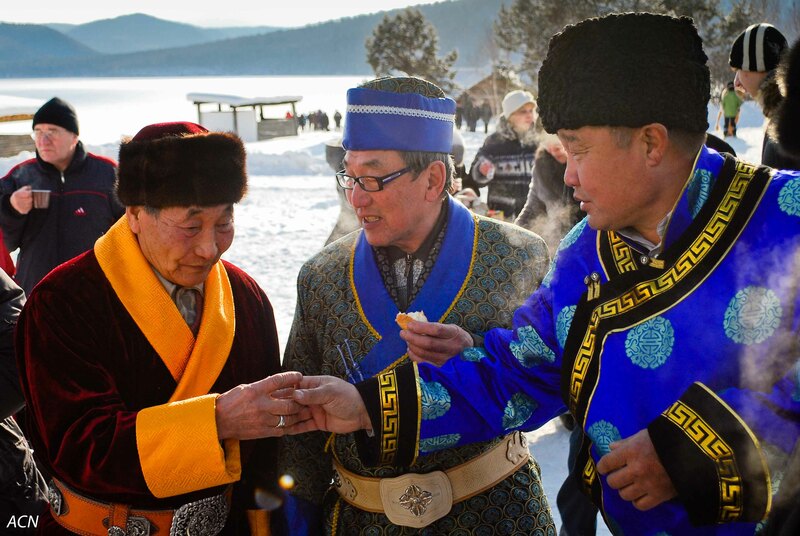 In December, elaborately carved, colorfully lit kremlins and stately buildings spring up around Irkutsk. Ice slides, sometimes two stories tall send young and old alike pell-mell into the pile of “recently slid” at the bottom. 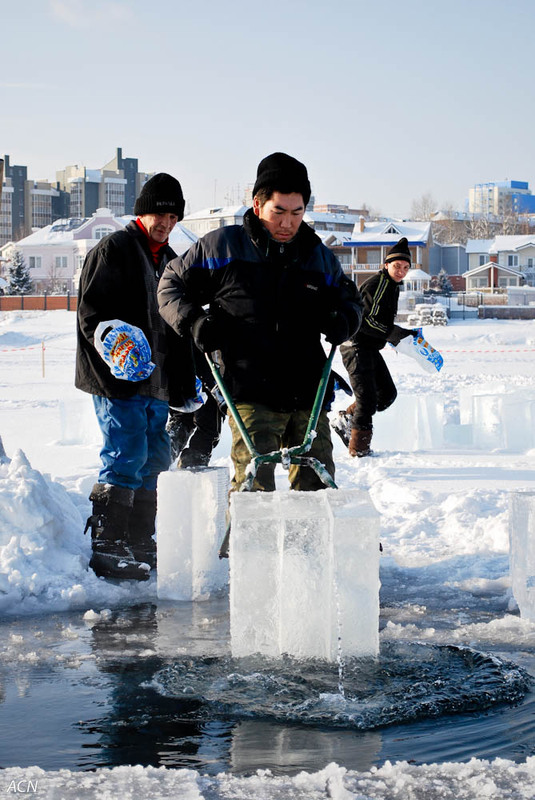 Crystal Swan provides ice for Irkutsk, Angarsk and Cheremhova’s New Year celebrations. Thanks to the crew at Crystal Swan, the city is bedecked in holiday cheer! The hard work behind sweet childhood holiday memories. 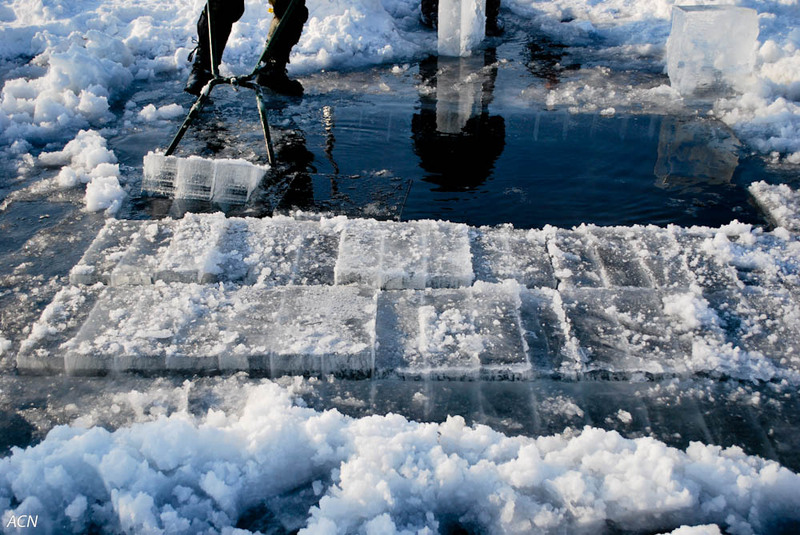 Keep a sharp eye, you may find aquatic plants frozen into ice blocks.